It comes as no surprise, therefore, that the number of Russian browsers who have engaged with our English and academic titles is quite small. The Anglo-American sphere comprises 45% of our readership, while the world’s largest country barely makes 1%. The majority are situated in the major centres of St. Petersburg and Moscow, becoming scarcer the further we go toward the Bering Straits. In a 2009 article published in Psychology Science Quarterly, Open Access participation was described as ‘somewhat questionable’ due to a range of factors, including language barriers and theoretical differences between Russian academia and the West in certain subjects (indicating a lack of Russian-language Open Access resources). Other factors included the lesser importance placed on publishing for career progression in Russia, and the difficulty Russian academics have in acquiring the fees that Open Access publishers often charge. But this may be changing. Despite the government crackdowns, English-language online resources are increasingly accessible to Russian academia. 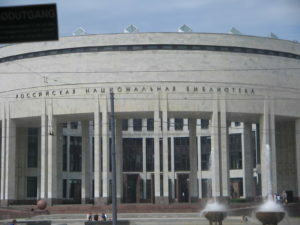 A quick Google of the top three Russian Universities – Moscow, Novosibirsk and St. Petersburg – reveals an abundance of links to free English-language databases and websites. Google itself also offers its fair share of accessible resources for those who can read English. The gradual rise in the total number of OBP readers from Russia between 2013 and 2018 (from 218 to 1300 by the end of last year, an increase of almost 500%) may also be a symptom of this situation. What is being read? We made a chart of the top ten titles that gained the most attention (see below). Unsurprisingly most of these books are to do with Russian history, reflecting a universal interest in seeing what the rest of the world is saying about your country. Book eight in the list, the Dictionary of the British/English Spelling System by Greg Brooks, might be evidence of a desire to break down the language barrier. Economics also features prominently. There are one or two intriguing anomalies – at sixth and seventh are Cultural Heritage Ethics edited by Constantine Standis, and Digital Humanities Pedagogy edited by Brett D. Hirsch, with neither book discussing Russia at all. Tenth is A Time Travel Dialogue, in which John Carroll discusses the continuing possibilities of that area of science. Indeed, of all engagements with this book by country, Russia comes up as fifth largest, beating predominantly English-speaking countries like Australia and South Africa. Information and Empire has received the greatest proportion of Russian readership, at 32%, and, unusually, the greatest percentage of readers worldwide (we would usually expect to see the US or UK in this position). The big question is, who is accessing these books? We saw an increase in the number of readers we received from September 2017, which can be traced to a Russian commercial eBook publisher, ‘eboox’, adding us to their list of international free book databases. This site is available both to Android and iOS users, so this is one way in which our books are easily accessible in Russia and are being read by a small (growing!) portion of the Russian population. The amount of academic readers, and its proportion in relation to public readership, cannot be determined. There is no way of knowing who accesses us via Google Books, which locks up such data. That the universities have not added us to their links of Open Access publications means it is less likely that students are using our books as research tools. But it is not improbable that the high traffic within St. Petersburg or Moscow, which contain two of the country’s most famous universities, points to rising academic interest as much as urban. Despite an increasingly stormy political horizon, we have been pleasantly surprised by Russian engagement with our extensive range of publications on their country, despite barriers of language, culture and access. Long may the connection continue. Jeremy Morris, ‘Actually Existing Internet Use in the Russian Margins: Net Utopianism in the Shadow of the “Silent Majorities”‘, Regions, 2:2 (2013), 183. This entry was posted in Notes From The Editor and tagged Information and Empire: Mechanisms of Communication in Russia, Open Access, Russia. Bookmark the permalink.